Let's be honest: Changing the power scheme on your laptop or desktop isn't exactly time-consuming. But clicking through a few screens to do so can be annoying, especially if you change your power options often. Power Scheme Toggler (free/donationware) eliminates this annoyance by allowing you to change your power usage profile with a click of the mouse. Simple task, simple interface: Power Scheme Toggler does what it says without fuss. Not all PC users may need to deal with power schemes, which are groups of settings that control the power usage of your computer. The scheme can automatically adjust the brightness of your laptop display when you're using the battery to power it, or can cause the computer to hibernate if it's been idle for a certain amount of time. Windows comes with various power schemes installed and you can add your own. 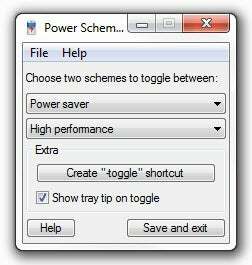 Setting up Power Scheme Toggler is almost as fast as using it: You simply choose two power schemes that you'd like to switch between, create a toggle shortcut (if desired), and click save. I dragged the toggle shortcut to my desktop, and double clicked on it whenever I wanted to change my power scheme. A pop-up notification confirms that change has been made. That's it. Power Scheme Toggler is as simple to use as it is to describe. It does have some limitations. You can only choose two power schemes to switch between, for example. And clearly this is not an app that's going to change the world. But it will make your life a little easier, one click at a time.